Windhaven Farms’ Tiz Breathtaking lived up to her name with a beautiful stretch run in the $125,000 Shady Well Stakes for Ontario-bred two-year-old fillies on Saturday afternoon at Woodbine Racetrack. Tiz Breathtaking broke well for jockey Eurico Rosa Da Silva and was settled back next-to-last in the early going before fanning out five-wide and blowing by her competition in the stretch to score in 1:05 flat over 5-1/2 furlongs on the main track. Sav stalked the pace three-wide and struck the front at the top of the stretch but had to settle for the runner-up honours 1-3/4 lengths behind the late-closing winner. Appella came through along the rail to finish third ahead of front-runner Sailing By, who had set the early fractions of :22.79 and :46.25. Owned by breeder William D. Graham’s Windhaven Farms, Tiz Breathtaking also won her career debut on June 10 then inherited second-place in the My Dear Stakes last time out on July 7 after suffering interference in the stretch. Doyle noted the Tiznow-I’m Breathtaking filly has displayed boundless potential just three starts into her career. Doyle has trained successive Shady Well winners following Glamanation’s victory last year and has now won a total of five editions of this stakes race in his career. Sent postward as the 4-5 favourite, Tiz Breathtaking paid $3.90, $2.30 and $2.10. She combined with Sav ($3.90, $3.30) for a 5-6 exacta worth $11.70. A $1 trifecta of 5-6-3 (Appella, $4.40) paid $58.35 and a $1 superfecta of 5-6-3-1 (Sailing By) returned $175.45. Moksgmol, Syllable and Maritime Breeze completed the order of finish. 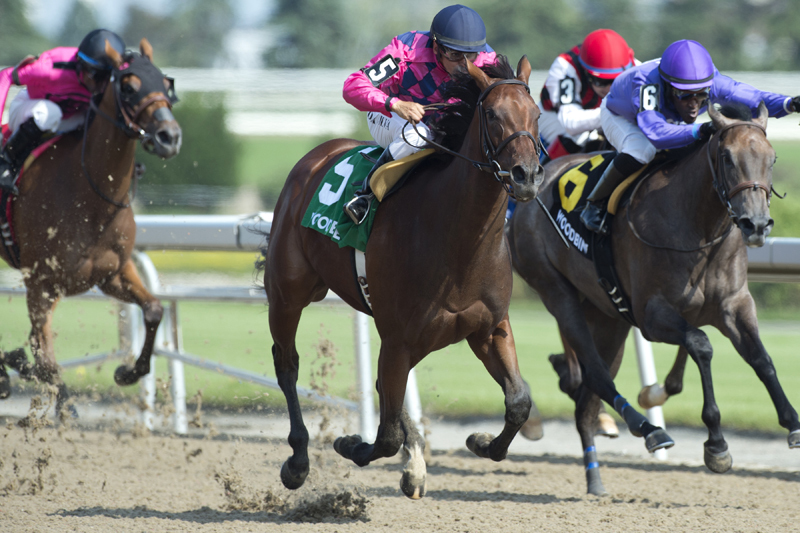 Live Thoroughbred racing continues at Woodbine on Sunday afternoon, featuring the $125,000 Clarendon Stakes and $100,000 Eternal Search Stakes. The $50,000 second leg of the Turf Endurance Series will cap off the 10-race program, which begins at 1 p.m.